Thursdays - Saturdays at 7PM. 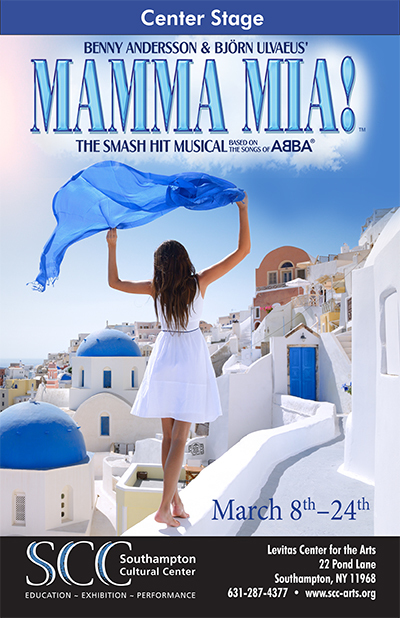 Eye-popping colors and toe-tapping tunes frame the Benny Andersson and Bjorn Ulvaeus crowd-pleaser, Mamma Mia! Performances begin March 8 and run through March 24. Michael Disher directs. Alyssa Kelly choreographs. Amanda Jones musically directs. 2) Claude's at the Southampton Inn (631-283-1166), located at 91 Hill St., Southampton. Guests who purchase this dinner & theater package can reserve a hotel room for $125 (excludes tax and gratuity). The price includes breakfast for two on the morning of checkout. 1) Fellingham's (631-283-9417), located at 17 Cameron St., Southampton. $52 for adults, $37 for students under 21. Includes brunch and a mimosa, tax, gratuity and admission to show. 2) Claude's at the Southampton Inn (631-283-1166), located at 91 Hill St., Southampton. $60. Includes tax, gratuity, and admission to show. 3) Edgewater Restaurant (631-723-2323), located at 295 E Montauk Hwy, Hampton Bays, NY 11946. $58 adults, $29 for children. Includes brunch, a drink, coffee and dessert, gratuity and admission to show.